Talking about the new Bing Bar. Today I have been trying out the new Bing bar in Internet Explorer 8 and thought it might be useful to write a post about how useful I have found it. It is actually almost a carbon copy of the MSN toolbar that I posted about recently and works in more or less the same way, in fact it has replaced the MSN Toolbar beta. You will need to have Silverlight on board in order to use the new Bing bar which is available from HERE..
Once you have downloaded the new Bing Bar from HERE , you can customize it fully to suit your tastes and interests. You can choose which buttons to have available for use by simply dragging them to and fro from the buttons drop down list which is accessible by clicking on the plus sign to the right of the default buttons, and there are some very useful ones to choose from. For example in my case, I don’t need the cars, money, sport or travel buttons, but I will make use of the TV, Tech and Gadgets, Weather, Windows Live and Life and Style buttons so you can fully tailor the choice of buttons to use to suit you, your interests and your lifestyle. As with the MSN Toolbar, by clicking on the Spanner icon on the right hand side of the toolbar, you can also choose the colour and a seasonal theme as well for your Bing Bar. On the far right hand side, you can input your Live ID by clicking on the small down arrow and inserting your Live ID credentials. The Toolbar will then show your Live ID icon on the far right hand side. . Once you are signed in, you can then click again on the small black arrow to either sign out or alternatively click on view your profile to be taken straight to your Windows Live profile page. A nice touch. To the immediate left of the spanner icon is a small green shield containing a tick which when clicked on states whether or not your computer is at the recommended safely level. I presume that when this is not so, the shield turns red to warn you that all is not well. Clicking on each of your chosen buttons on the toolbar instigates a drop down list of choices depending on the button in question, and I try to show some of the choices available to you here. 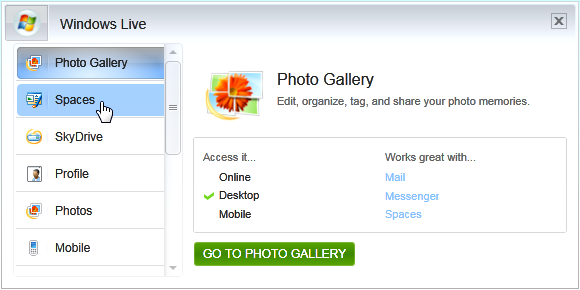 For example, clicking on the Windows Live button if you have chosen it for your Toolbar will then display a drop down list allowing you the choice of going or accessing Live Photo Gallery, Spaces, SkyDrive, your Profile, your photos or alternatively your Mobile. So a quick and easy way to access all of your Windows Live pages and applications whilst you are browsing the web. 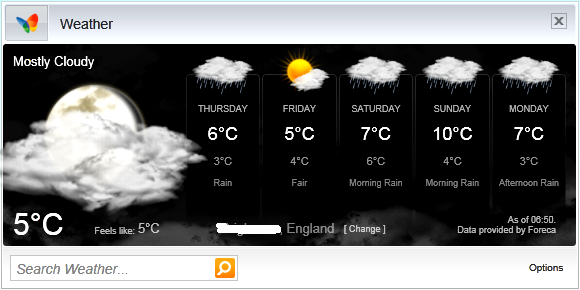 The weather button is fully customisable and once you have input your location either via your postcode or town, shows your local weather in a very attractive format for the next five days complete with descriptive icons ably illustrated by the picture below. One button I was very keen to include in my Bar was of course the Tech and Gadgets button, and again this when clicked on shows a variety of technological news about the latest Gadgets and includes News, Features, Photos, Shopping, Mobiles and also an MSN blog about Technology and Gadgets. I had better use this particular button with some caution or I might end up going on a big spending spree! The News button features the news from your particular location, so in my case the top news in the drop down list is from the UK. Similarly, the TV button features news about the TV programs currently being shown in your location so in my particular case, the drop down features the latest news from ‘I’m a Celebrity, Get me out of here.’ which is currently showing this week on ITV. All the news in the list features a small screen of the person being talked about in each news feature. Again in the TV button list, there is quite a choice available to peruse, such as news, Features, Photos, Video, Soaps and another blog to read. Quite a comprehensive list to work through! I am certainly going to use this Bing Bar from now on, it is definitely as good if not better than the MSN Toolbar that I was previously using and I thoroughly recommend that you give it a try. it is fully customisable to suit you and your interests and that is always a winning feature in my book! So take a look at this video about the new Bing Bar and then why don’t you give it a try! It works in both Internet Explorer and Firefox.